An unidentified feminist threw an absolute tantrum during Saturday's Los Angeles Women's March. The woman — complete with a shaved head and "infinity" tattoo above her ear — confronted a group of President Donald Trump's political supporters attending the march. The pro-Trump group all wore red "Make America Great Again" hats and, judging by the video footage, sought to peacefully engage Women's March demonstrators to discuss politics and culture. YouTube user Fog City Midge shared the video, which she captioned, "No facts, no argument, all hate." "This woman confronted us at the recent Women's March in LA," the caption said. "She began by screaming that she did not want equality but wanted the 'the whole f'ing thing' before moving on to MAGA hats, cleaning [sic] they incite FEAR and are RACIST!" "What is she doing though?" the caption adds. "Inciting FEAR! Facts don't matter to them. This is dangerous. The Left is a cult. We must protect America from these haters before they destroy everything." 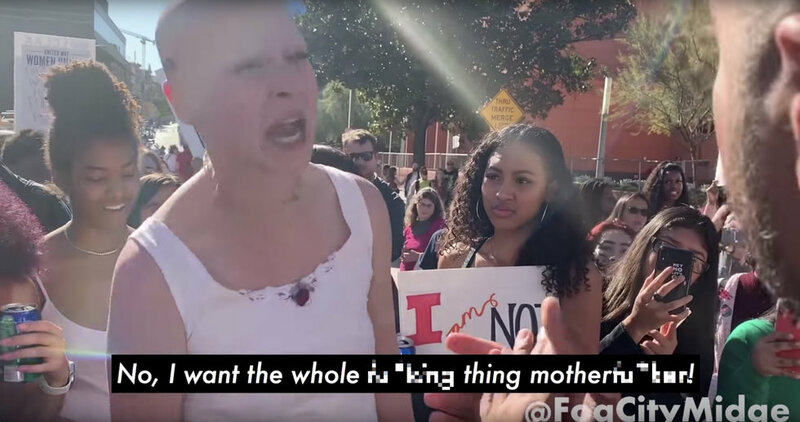 In the video, the woman can be seen screaming about wanting equal rights, and then not wanting equal rights, but wanting "the whole f***ing thing" instead. Then she goes on to laugh and cackle wildly. Later, she turns pensive and peaceful while telling one of the MAGA hat-wearing men, "We are all equal. We are all one, sir." At one point, she tearfully implores one of the men to "pay attention to fear and not logic." 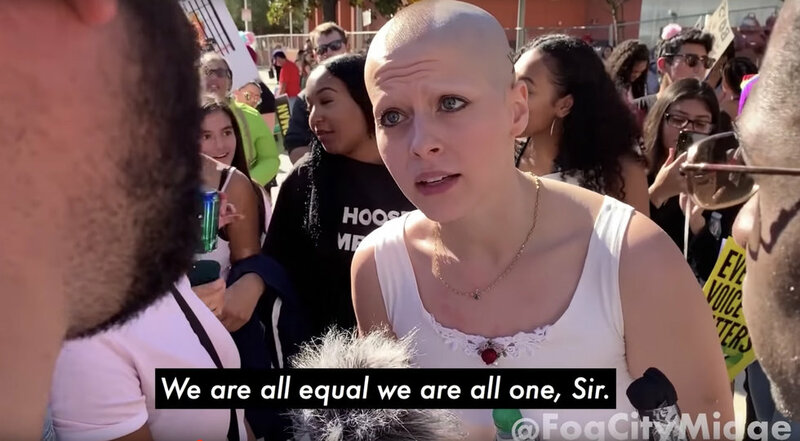 The MAGA hat-wearing man says that everyone should be treated equally, and says "God bless you." The woman, clearly moved (or something), goes in for a hug. The feminist goes on to ask the man's name — which he tells her is David — and she responds, "That is the most beautiful name. That's an angel's name, isn't it?" She coquettishly grins. That's where the seasons change again, and she turns her full focus on David's MAGA hat. "Think about your hat and the way it makes people feel, because it incites fear in all those around us," she pleads. Then she goes on to tell David that she is afraid of his hat. 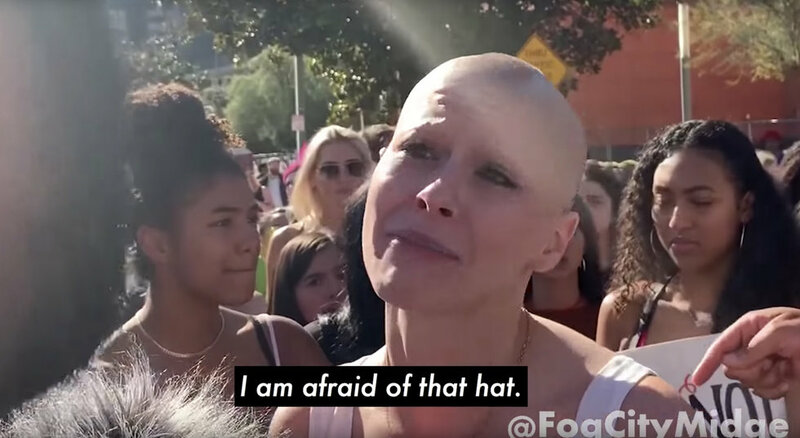 "Every person is afraid of that hat!" she cries. "I am afraid of that hat!" The woman goes on to tell David that "for so many people [that hat] is racism." David presents the woman with facts, saying, "That's because of the mainstream media's narrative that's painted Donald Trump as a racist. I don't agree with the narrative." He adds, "I'm out here to try to share that that narrative is skewed." "As a human being," she responds, "we should pay attention to fear and not logic." Things get heated (again); lather, rinse, repeat.